A second life for old banjos in the music world. Restored and new banjos for sale. Set up and repair service. For the love of music .. PLEASE NAVIGATE THROUGH THE SITE BY USING THE PAGES CHOICES ON THE TOP OF THIS PAGE. Second life banjo / Carl Arcand classic banjo. Old Time thin rim No. 8 of 10 Dobson tone ring. Price : $1650 including hard shell case and shipping. 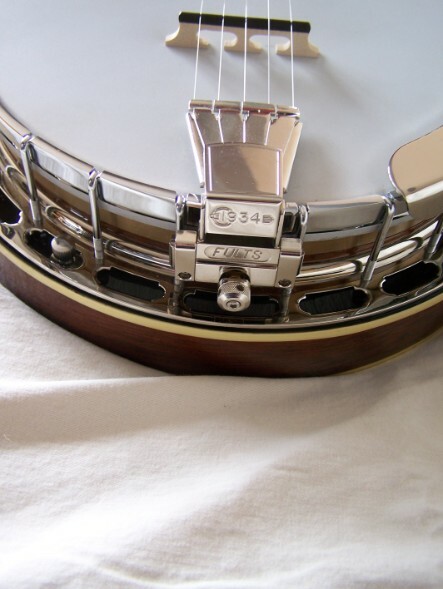 More details on the ''Five strings banjo'' page. You can read reviews about my banjos and my work by visiting these links. 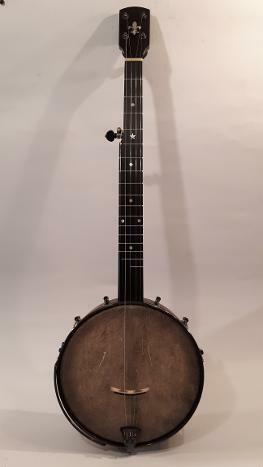 Gibson trapdoor banjo with original armrest and pick guard. Actually a tenor in great condition. Orpheum No.2 12 1/8 inches rim Tenor banjo. Vega style N 10 3/4 inches rim with Tenor neck in good playing condition. Vega little wonder 10 15/16 inches rim with Tenor neck in good playing condition. Vega banjo mandolin 10 inches rim with neck in good playing condition. Most of the banjos I recover need a new neck and some replacement parts. I shape the necks using manual tools ( raps, files, sanding blocks, chisels, drawknive, spokeshave) and take all the time necessary to make sure it is comfortable and easy to play. Every neck is made with the best quality wood and parts. Inlays are Mother of pearl or Abalone, I do not use plastic or synthetic inlay material. Most of the bindings are made of wood ( curly maple, bloodwood, Ebony, ) and on some occasions I use plastic synthetic tortoise or binding to match an original binding on the rim or resonator. All the replacement hardware parts are made of brass with or without nickle plating. I do not use cheap metal parts even on a low budget banjo. It is a passion and my goal is to put back to life old banjos making sure that they will last a life time and sound at their best. 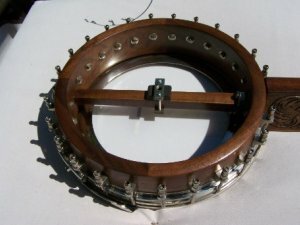 Some of the best banjo makers are using submerge wood or old factory wood to make their banjo's rims. New knowledge in the banjo lutherie carries to use old wood to improve the sound quality of the instruments. While recovering vintage banjo rims, I go in the same tendency. I am convinced that it does influences considerably the sound quality of the banjos. I also noticed as the density of wood is in most cases much higher than what is offered on the current market. Of course one day I will probably run out of good quality vintage rims but for now it gives me the opportunity to offer great sounding banjos for a fraction of the price. These old rims crosses the years without stumbling and were made to last. Using only the best hardware available I make sure that the banjos I build or restore are easy to set up and easy to keep in perfect shape. Not only high quality parts are easy to work with but they also raise the value of the instrument. they also give the banjo a better sound.